I recently heard that Lord of the Rings Online’s Beorning (or Skin-Changer) class was on sale. I remembered that I had a pile of Turbine Points lying around from the last time I played, so I figured I’d give it a shot for old times’ sake. LotRO was one of my first MMOs, and the one that established my altaholic tendencies. It started with making some poor, uninformed choices for my first couple of characters. First was my hunter, whose overwhelming single-target ranged DPS made him boringly easy in solo play, and everyone told me they’re not that useful in the endgame, so I decided not to bother. Next was my Burglar, who was fun because of stealth, but had the opposite problem of being useful for groups but not that fun to level. Minstrel and Lore-Master were both really fun for a while, but, for whatever reason, fizzled out before I made it over the Misty Mountains. I stuck the longest with my Captain, but, being a tank/healer class, Caps can take on four or five mobs at once without going below half health… as long as you don’t have anywhere to be for the next few days (though I’m told their DPS has gotten better since I played last). Don’t get me wrong, I enjoyed all of my characters, but, despite playing off and on for a few years, the farthest I ever got was the first few quests of Moria (despite owning the Mines of Moria, Siege of Mirkwood, and Rise of Isengard expansions). So now I’m back, and trying out this new class. 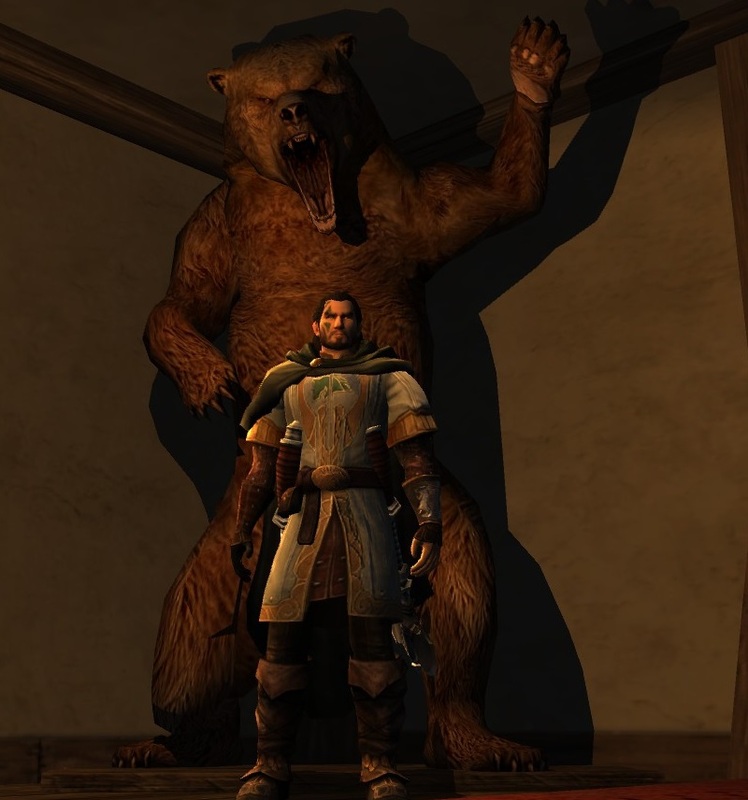 It’s been seven years since LoTRO added new classes (Warden and Rune-Keeper with the Moria expansion), so I feel like the Beorning class is a big deal. It’s an interesting idea; you can basically fulfill all three roles of the Trinity: DPSing and healing in man form, and tanking in bear form. It also takes full advantage of LotRO’s revamped talent tree system to make big changes in your playstyle based on your spec. It’s probably the closest thing to WoW’s Druid I’ve seen in any game I’ve played. I say that bear form is the tanking form, but either they’ve made the first few zones easier or the Beorning is a truck; even in man form I BEARly take any damage and can kill pretty fast. It occurred to me last night while I was doing a skirmish scaled to 5 levels higher than me that I’m basically Wolverine; I have a HoT that heals me faster than a swarm of mobs can damage me, while I crank out lots of damage (this weird analogy brought to you by my recent marathon of the entire X-Men movie franchise). This gives the Beorning a very Guild Wars 2 feel–i.e. very self sufficient and mobile–but still maintains the unique feel of LotRO. I’m nearly level 25 and I still haven’t died once. This might be the first time I’ve gotten the “Undying” title for hitting 20 without dying (I think the first time I died as my Lore-Master was in the starter zone). I haven’t really read much player opinion on the class, but I can’t help but wonder if the Beorning is just a tad overpowered. Granted, they don’t have much AoE to speak of, so maybe they’re just the melee counterpart to the Hunter with a tanky transformation gimmick thrown in, and maybe they suffer the same fate of a weak endgame; a jack of all trades is master of none. I’m not really sure I want to know, because I’m having a lot of fun with it. 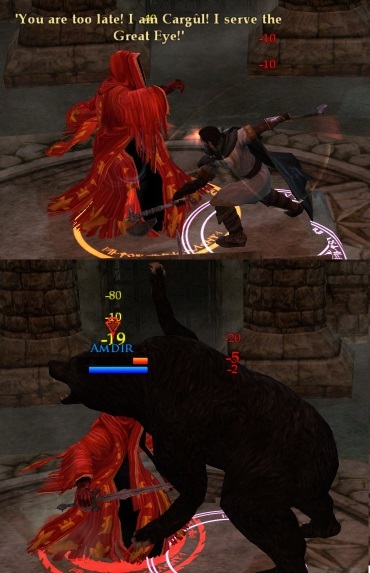 After playing so much Guild Wars 2, the pace of LotRO combat is a little hard to BEAR at first. I guess that goes with being an older, more traditional MMO. That’s not to say that the game is painful to play. Turbine has made a lot of improvements since I left (open tapping, yay! ), and it’s oddly refreshing to be back to a game where I can pick up five or ten quests in the quest hub, do them all in the same forest, then turn them all in at once for big piles of shinies. Also I’ve really missed skirmishes, instances that scale to your level and group size, even if that group is just you. I’m also interested in the War Steeds system, which I’ve heard from multiple sources is the best mounted combat of any MMO to date, but it’ll be a while before I get there. Will LotRO be my main MMO again after all these years? I don’t think so–I couldn’t BEAR to leave Guild Wars 2–but it is certainly a nice distraction until GW2: Heart of Thorns arrives.